What a month! I just got back from 3 weeks traveling around Egypt where I was able to perform for thousands of people and teach a 4-day workshop to a small team in Cairo. It was a trip that came out of nowhere and turned out to be one of the best trips we’ve taken in quite some time. We also got to experience more rain than anyone living could remember. The people, the food, the sights…everything was amazing and we can’t wait to go back! For a little background, I was contacted about performing for a festival back in October. I was very keen on the idea since I hadn’t been to Egypt yet. 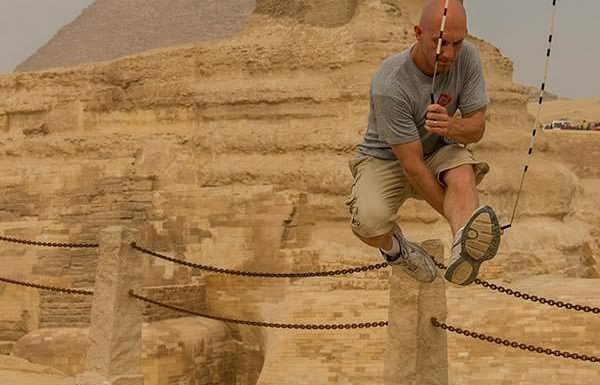 The following day I received a message from someone else in Egypt about teaching some jump rope workshops some day. Within 2 days I was contacted by 2 totally independent people…sounds like Egypt is the place I need to be. We worked out the rough schedule and then headed to the airport at the beginning of November. I had a jump rope show at an Upward event in Atlanta at 6PM then was quickly rushed to the airport in time for our flight to Amsterdam and then Cairo. It seems like all the international arrivals into Cairo land after midnight (at least all the ones I could make work with my schedule) so we got off the plane at 2 AM. Thankfully everything went smoothly with customs and then found out we had to wait for another group (skateboarders) that had just landed. When the van showed up for the hotel it was already packed with the skaters and our stuff got strapped to the top of the van. It’s always a fun adventure to make luggage fit for a lot of performers. We eventually made it to the hotel at 4 AM and were told that we needed to leave by 8:30. Sleep was not something we would have much up for the first few days of this trip. We spent the day seeing some sites in Old Cairo and were about to head out to our performance location when we found out that almost everything had been knocked down by a storm! Turns out that over the next couple of days we would experience more rain than anyone alive could ever remember. Being in a desert country and having a lot of rain leads to some exciting scenes. We saw semis with water up to the drivers window amongst other things. We spent an extra day in Cairo and saw the pyramids (who goes to Egypt without seeing those). We headed out to the festival location (El Wadi) and had quite a few detours as we tried to skirt around any large bodies of water we encountered. When we arrived we found the various outdoor performance locations were covered in mud and tents were down everywhere. They ended up canceling the first day of the festival so we could do some cleanup. I haven’t had to scrape mud off a basketball court before, but I got that experience on this trip. I also got to scoop water out of a skateboard bowl. I hadn’t done that before either. After a ton of cleanup, it started to pour rain again! Thankfully the mud didn’t cover everything up again, but it required some more cleanup that evening. Thankfully we were ready to go the following day and the buses started pouring in with thousands of people. I did 2 jump rope shows on a tennis court both days of the festival. Beside myself, some of the other performers did things like: skateboard, bmx bike, fmx motocross, basketball spinning, unicycling, jiu jitsu, clown, illusions and more! There was quite a variety of performances and it was fun to meet some different performers that I had heard about for years. The last night of the festival they had a main stage event and they invited me to put on a 7 minute demo. There were about 6,000 people that saw me live for that show and they also broadcast it throughout the middle east with upward of a few million people watching. It was quite a fun show and the crowd loved it. With the fast paced schedule of our first week over with, Alicia and I had a week of tourist excursions planned. We headed down to Luxor for 2 days to see the Valley of the Kings, Karnak and the Luxor Temple. It was quite awesome to see the history that exists in Egypt. Everywhere you turn there is something that is thousands of years old. Being a photographer on the side, I was like a kid in a candy store. We really didn’t get much rest in Luxor, but we had a great time. We headed back to the airport and flew over to Sharm El-Sheikh. Yes, the same airport that just had a plane crash from a bomb. We are not easily scared off of places. It turns out, there was nothing to be scared of. We spent a couple days scuba diving in the Red Sea and then did an all night hike up Mount Sinai. The hike was 7km each way with a 4-5,000 foot elevation change. With as much as I work out, it was still a tough hike. I think this was primarily due to the fact that we started hiking at 1AM to get up top for the sunrise. Out of all the things we saw and did, this was easily one of my favorite parts of the trip. The drive back to Sharm from Sinai was close to my least favorite. We flew back into Cairo and were picked up by Ahmed and Mai. They are in charge of the only jump rope team in Egypt (that I am aware of). We ended up putting on 4 days of workshops with them (you can read more about that over at Jump Rope Secrets). We then headed back to the airport and caught the long flight home. Due to the recent bombing, security was quite stringent out of the country. We had something like 5 different full security screenings before we could get on the plane. They definitely want to make sure everyone feels safe. All in all, this was one of the most fun trips that we have taken in a while. We got to do a lot of jump rope, sight seeing, scuba diving and more jump rope. We got to experience more rain than anyone alive could remember seeing, near empty tourist towns and an epic hike up one of the most famous mountains in the world. Would I ever go back? Absolutely and I really can’t wait for the next time. I would definitely recommend taking a trip if you get a chance. We had Peter perform for our school and our kids were very impressed. He has an amazing amount of energy, gets kids involved, and relates his talent to the game of life when he speaks. I had lots of parents tell me he was the talk of their dinner that night. We want to put people in front of our kids with a powerful message and an ability to get kids to dream and visualize success. Peter more than achieved this and I would recommend him highly for any school, business, or youth event.